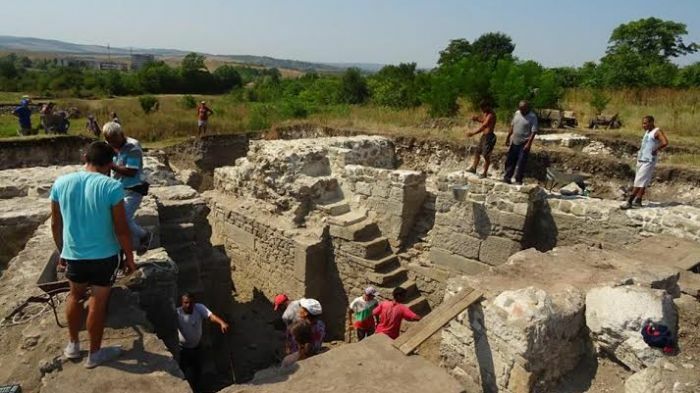 А well preserved and untypical fortress tower from the Late Roman / Early Byzantine period on the northern fortress wall of the Ancient Roman colony of Deultum in the southern Bulgarian city of Debelt, Sredets Municipality, not far from the Black Sea coast, has been unearthed by the archaeologists carrying out the 2015 summer excavations in the Debelt – Deultum Archaeological Preserve. The Ancient Roman city of Deultum (Colonia Flavia Pacis Deultensium) was built in the 1st century AD near a previously existing Ancient Thracian settlement called Debelt or Develt. It was settled by Roman military veterans from the Augustus’ Eight Legion (Legio VIII Augusta) near the Mandra Lake (today the Mandra Water Reservoir) where it also had a port connecting it to the Black Sea. Deultum was a Roman colony, which according to Roman law signified a status equal to that of Rome itself. In today’s Bulgaria, there are only three Roman cities which enjoyed this status – Deultum (Colonia Flavia Pacis Deultensium) near Burgas, Ratiaria (Colonia Ulpia Traiana Ratiaria) near Archar, Ulpia Oescus near Gigen. The preserved fortress tower from the northern section of the wall of the Ancient Roman city of Deultum is said to be a very complex facility which is similar to fortress towers in some areas of North Africa which were part of the Eastern Roman Empire known today as Byzantium in the 5th-6th century AD, reports local news site Kmeta. “The tower was built in the second half of the 5th century AD, and protected the city for about 100 years. It was destroyed at the end of the 6th century during the attacks of Slavs and Avars," Assoc Prof. Lyudmil Vagalinski, head of the program for the study of Deultum and Director of Bulgaria’s National Institute and Museum of Archaeology, is quoted as saying. He adds that the inhabitants of ancient Deultum took major precautions to protect the city from attacks from the north. “There is a hill [to the north] and limited visibility, that’s why they could be attacked easily. The tower was built at a time that was hard for the [Eastern Roman] Empire during the attacks of Attila’s Huns. The complexity of the facility – which is very different from the other regular rectangular towers – shows that Deultum was very important strategically. It is possible that the capital of the Empire, Constantinople, allocated funding for the construction of such a large-scale defensive facility – an entire fortress wall together with the tower," says Vagalinski. The report notes that the fortress wall of Deultum reaches the nearby Sredetska River which provided a connection to the Black Sea via the Mandra Lake (today the Mandra Water Reservoir); the fortress wall was put up in the 5th century AD, and while it protected the city’s major public buildings, any building left outside of the wall were torn down in order to prevent any hostile forces from using them as cover. Sredets Municipality has drafted a project for the emergency conservation of the newly uncovered archaeological structures in the Debelt – Deultum Archaeological Preserve worth about BGN 2 million (app. EUR 1 million), and is going to seek EU funding for it. 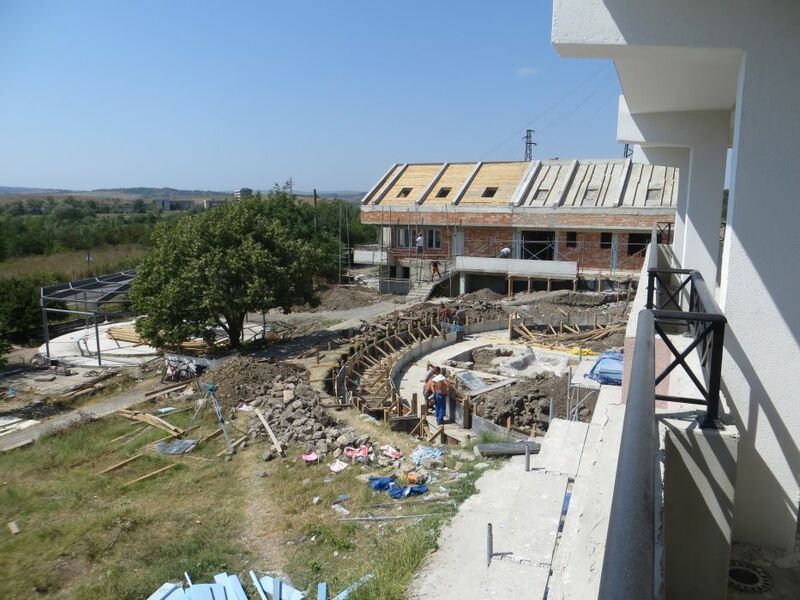 Meanwhile, the municipal administration in Sredets has announced that by the end of October 2015 it will complete the reconstruction of the archaeological museum and facilities in the Preserve. The project provides for the museum’s reconstruction and the establishment of a visitors’ center is worth BGN 2.8 million (app. EUR 1.43 million). It is funded under EU Operational Program “Regional Development", with Sredets Municipality providing BGN 490,000 in co-funding. “This is a chance for Sredets Municipality to develop a new kind of economic activity such as cultural tourism," says Sredets Mayor Ivan Zhabov, who adds that the new museum in the Debelt – Deultum Archaeological Preserve will create 10 jobs. After the completion of its new museum, the Debelt – Deultum Preserve will be one of the few archaeological centers in Bulgaria with a workshop for the restoration of archaeological artifacts. The ruins of the Ancient Thracian settlement of Debelt (Develt) and the Ancient Roman city of Deultum (Colonia Flavia Pacis Deultensium), which was also a medieval Byzantine and Bulgarian fortress in the Middle Ages, are located near today’s town of Debelt, Sredets Municipality, Burgas District (17 km east of the city of Burgas), near the Black Sea coast of Southeast Bulgaria. The Roman city of Deultum itself was founded during the reign of Roman Emperor Vespasian (r. 69-79 AD) on the northern bank of the Sredetska River, near the Mandra Lake (today the Mandra Water Reservoir) where it also had a port connecting it to the Black Sea. Deultum was a Roman colony, which according to Roman law signified a status equal to that of Rome itself. In today’s Bulgaria, there are only three Roman cities which enjoyed this status – Deultum (Colonia Flavia Pacis Deultensium) near Burgas, Ratiaria (Colonia Ulpia Traiana Ratiaria) near Archar, Ulpia Oescus near Gigen. Deultum was settled by Roman military veterans from the Augustus’ Eight Legion (Legio VIII Augusta). On the 30th anniversary since the founding of the Roman colony Deultum, then Roman Emperor Trajan (r. 98-117 AD) minted a special emission of bronze coins. There are indications that at some point between the 130s and the 150s Deultum was seriously damaged by a barbarian invasion. The Roman city was further strengthened during the reign of Emperor Marcus Aurelius (r. 161-180 AD); its limits were marked by inscriptions at two points – in today’s southern suburbs of Burgas, and at the ancient fortress in the town of Golyamo Bukovo.